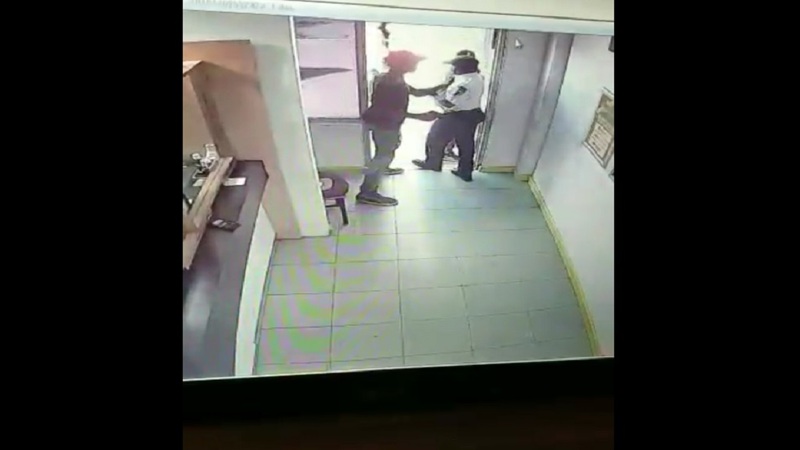 A screenshot from CCTV footage of the fatal attack on a security guard in Portmore, St Catherine last week. KingAlarm Security Company has rubbished claims that it failed to respond appropriately to panic alarms raised by an officer before he was shot and killed by gunmen at a business establishment in Portmore, St Catherine last week. Lincoln Graham was fatally shot during what the security company said was an attempted robbery by armed men at the business place he had been assigned to in the ‘Sunshine City’. However, since the incident, social media has been rife with speculation. Among the allegations, it has been claimed that the security guard, before being fatally shot in the head, had pressed the panic button twice but an adequate response never came. King Alarm, in a statement Tuesday attributed to its managing director, John Azar, refuted the claim. “Without disclosing specific details about this incident, we hereby confirm that any and all alarm signals received on the day in question were actioned professionally and efficiently by our command centre operators, and in full accordance with our operational standing orders,” Azar said. Azar said, due to client confidentiality agreements, and the fact that the incident is the subject of an ongoing police investigation, the company is not at liberty to share or discuss any further details relating to alarm activity on the day in question, or the circumstances which might have led to the tragic fatal shooting. “As we did in our earlier statement, we ask persons with information relating to this heinous crime to call Crime Stop anonymously at 311 or to provide such information directly to the Jamaica Constabulary Force,” Azar said. He also encouraged members of the public to remember officer Graham and his family in their prayers. Meanwhile, police officers are reviewing CCTV footage of the incident. A four-minute video captured on CCTV showed two men entering the facility where the guard was working. The men were seen waiting until all the customers had left from the business outlet before they accosted the security guard. The video also showed that one of the attackers had even borrowed a pen from the security guard to sign a document, seemingly in an attempt to hide his true intention. The footage showed that, as the men were about to carry out the attack, two customers were entering the facility. In response, one of the attackers pushed the customers outside the door and attempted to close the door. The guard saw what was happening and began to move towards the door. One of the attackers, who was seen holding on to the guard with a gun in his (the attacker’s) hand, then pulled the guard outside the establishment and shot him. The men then ran from the scene. The shooting sent large numbers of onlookers scampering for safety.